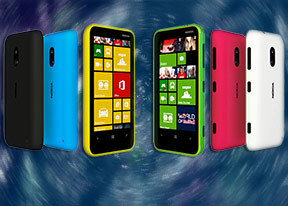 The Nokia Lumia 620 boasts a 5 MP camera which is capable of taking pictures of 2592Ñ…1936 pixel resolution. The camera UI is pretty simple - you have your viewfinder and some controls on the right. From top to bottom they are the still/video camera toggle, front/back camera toggle, flash mode setting and the Lens button. On the left you have an arrow that takes you to the images taken with the camera, alternatively you can do a swipe gesture too. The camera app on Windows Phone offers extensive settings, ranging from scenes and effects to white balance, contrast, saturation, sharpness and ISO among others. You have a dedicated Macro focus mode but no face detection. The flash can be set to auto, forced or off. The shutter key will wake the phone up with a single press and launch the camera app. The Lumia 620 is not the fastest shooter around and it takes it a couple of seconds before a photo is taken. This is a longer delay than we're used to from modern smartphones. Lenses are an interesting take at feature add-ons, enhancing the camera functionality without making a mess of third party apps each with its own UI. Lenses are accessible directly from the native camera app (they show up in the list of installed apps too if you want to pin a Lens to the start screen). Nokia has preloaded the Smart Shoot lens, which is by far the most powerful, and you can also download the Panorama and Cinemagraph lenses. Smart Shoot uses Scalado technology (Nokia owns the company) - it shoots multiple photos and lets you pick which one to save (a sort of burst mode). You can also pick the best face and cycle through each facial expression a person made while the camera was snapping photos. The third option is Erase, which will remove moving objects (e.g. someone walking in front of the landmark you're trying to shoot just as you press the shutter). Panorama does what it says - you press the shutter and then align the camera as instructed (the app will put circles you have to aim for). It's good, but you always shoot right to left (can't switch direction), which is a bit annoying. Although far from the best on the market, the 5 MP camera on the Lumia 620 actually produces photos with pretty solid image quality. The level of resolved detail is great, colors are very pleasant and the dynamic range is decent. The noise is fairly high but the overall result is still really nice. Colors are a wee bit dull in most cases but they still look truer to life. The close up mode or otherwise macro is great. The Lumia 620 can focus from a really close distance. Cinemagraph creates photos that are mostly static, but a part of them is animated. You have to hold the phone steady while shooting. When you're done, the Lens will offer two (sometimes three) areas that can be animated and when you pick an area, you can tweak the animation, trim it, and set the loop pattern. The Nokia Lumia 620 enters our photo quality comparison tool, where you are free to face it with any of the smartphones in our data base - the tool's page will give you information on what to watch out for. The camcorder interface is identical to the still camera's and has plenty of features too. You can change the white balance, sharpness and the video resolution among other things. The LED flash can be made to work as a video light, too. The Nokia Lumia 620 captures 720p videos, which are pretty smooth, and have a decent amount of resolved detail for the 720p league. Colors look pretty good too, even if slightly oversaturated. Bitrate is reasonable at 10.5 Mpbs and the framerate is firmly at 29 fps. Sadly, the Lumia 620 captures only mono sound at 98 Kbps bitrate and 44 kHz sampling rate. Here's a 720p video sample we've uploaded to YouTube. You can also download an untouched 720p@30fps video sample. The Nokia Lumia 620 is ready to bump heads with the likes of the HTC Windows Phone 8S and Samsung's Galaxy S III mini in our video quality comparison tool. Once again you should consult the tool's page for information on what to look out for.